structures. Steel corrosion is an oxidation process requiring the presence of air (oxygen) and moisture. Corrosion is promoted by anions, like chlorides, and an acid environment. Corrosion is inhibited by an alkali, contaminant free environment, restrictive to air and water penetration. In new concrete rebar is protected by the high pH and low contamination levels. However, as time passes, the pH of concrete falls. Concrete becomes infiltrated by chlorides and other contaminants. Electrochemical activity increases. The process perpetuates itself as the oxidized rebar expands forcing concrete to crack and delaminate thus encouraging air and water penetration. From there the problem grows exponentially - the more concrete fails the more likely it becomes to fail. 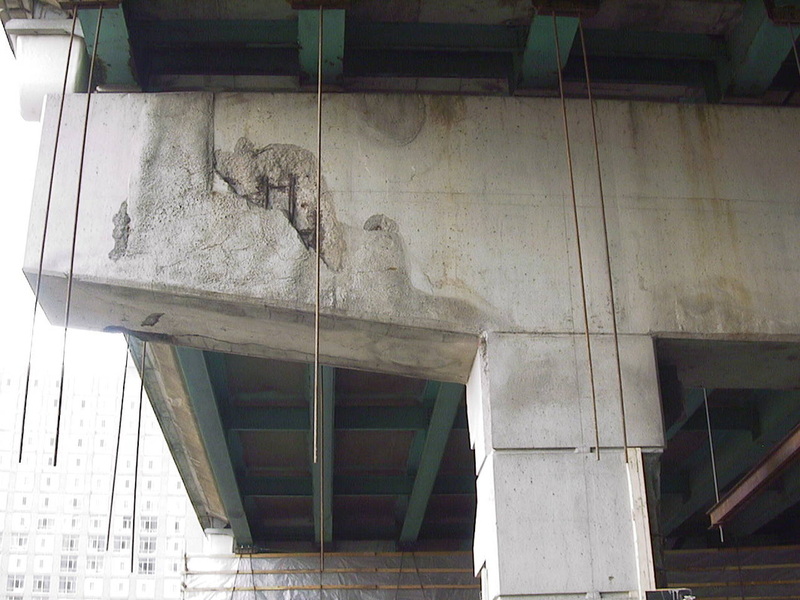 Once started, rebar corrosion cannot be stopped by simply waterproofing the surface. In fact, application of a waterproofing membrane or coating routinely makes the situation worse by trapping chlorides and moisture inside and not allowing for proper drying of the substrate. 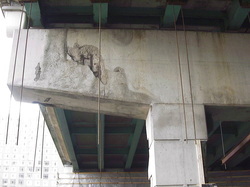 SURTREAT concrete restoration materials are chemically reactive. Properly applied the materials penetrate to combine with the cement phase and deposit on the embedded steel components. 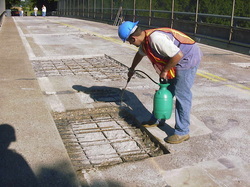 SURTREAT creates a non-corrosive environment internal to concrete by isolating moisture from the rebar, by not allowing chloride penetration even under the static pressure (such as applied, for example, by car tires), by removing and complexing the existing chlorides, and by moderating pH. In addition, corrosion inhibitors, used as part of the SURTREAT process, are direct contact inhibitors designed to insulate and pacify active sites on the embedded steel surfaces as well as prevent the deleterious action from starting. The application of SURTREAT does not prohibit concrete from drying. Concrete retains its ability to "breathe". SURTREAT is an easy to apply flexible system for restoration or maintenance. The use of SURTREAT provides for cost reduction long-term and during restoration.